“Are you really sure that we are going?” P. asks as the three of us sit at the table for breakfast. 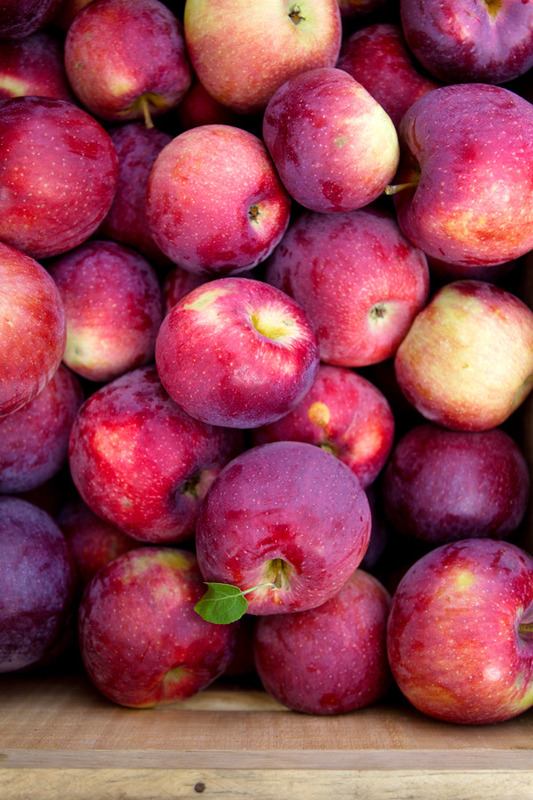 The aroma of apples sautéeing in butter and sugar in the kitchen makes it feel even warmer and cozier than usual. And that despite the pouring rain we can hear against the large kitchen windows. Lulu is happy. She is singing “Bonjour, tu vas bien, j’ai dix doigts et deux mains, deux yeux toujours fatigués, comme tous les matins!“. She loves that she can teach me this new song learnt from N., her new maternelle teacher. She is very fond of her. Sa voix de fillette est un délice à entendre, I cannot help but think as I listen to the song. “On y va bientôt maman ?” (Are we going soon?) she asks when she sees me standing up. I am surprised to find her so eager to go since we all feel short of sleep. It’s a funny-kind-of good feeling, actually. That very one of a lazy Sunday morning after a night out spent with a jolly group of friends. “I think we are going,” I tell her and P.
Our friends probably too, since none of them sends a text to tell us otherwise. 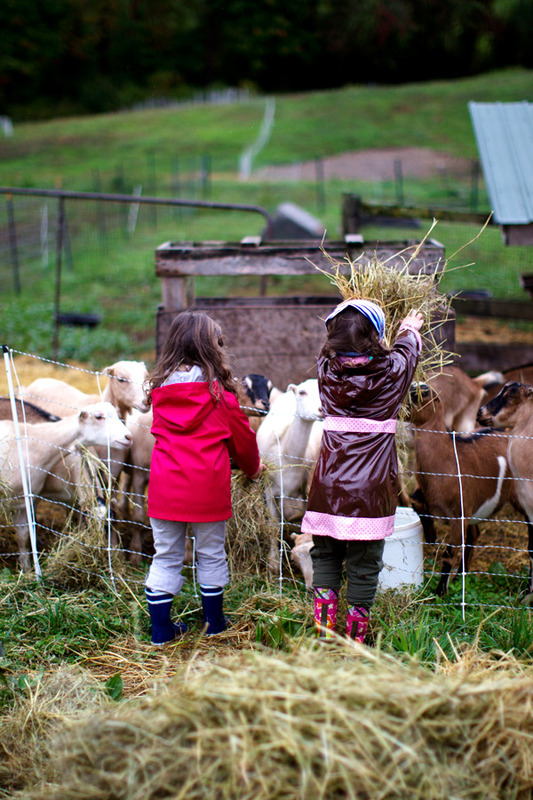 Looking at the rain, though, it’s hard to imagine that it’s a good idea to spend time outside to visit a goat farm. The thing is that I’ve really wanted to visit goats for a while. None of her words are lost–each resonates in my head, quickly turning into a weekend plan. “I know what we are doing dimanche, I tell P. as soon as I am able to talk to him on the phone. I don’t wait for his response. It’s all I am thinking about until Sunday comes. We are obviously lucky that day. As we get close to the farm, the heavy morning rain disappears. 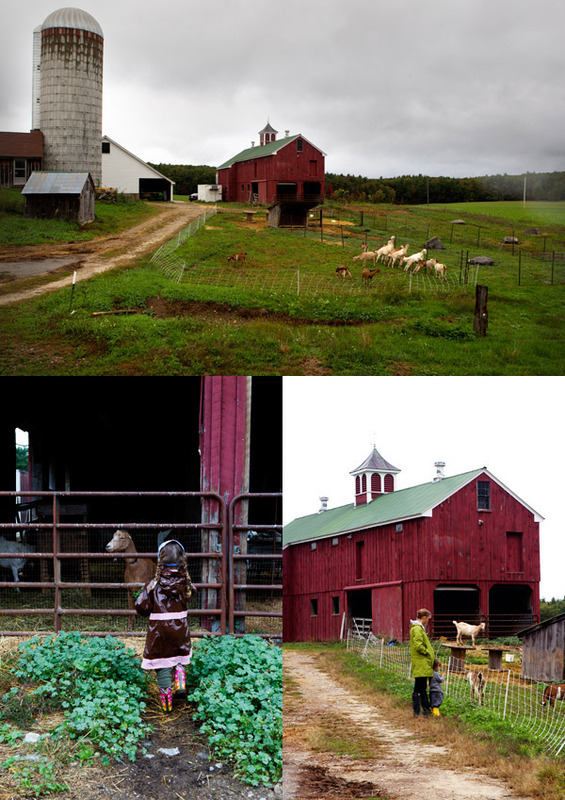 Crystal Brook Farm is a small family owned goat farm tucked away in Sterling, just an hour-drive west of where we live. With its rolling hills and green open fields, it’s hard to imagine a more picturesque area than this one. I love the authenticity of the place right away. 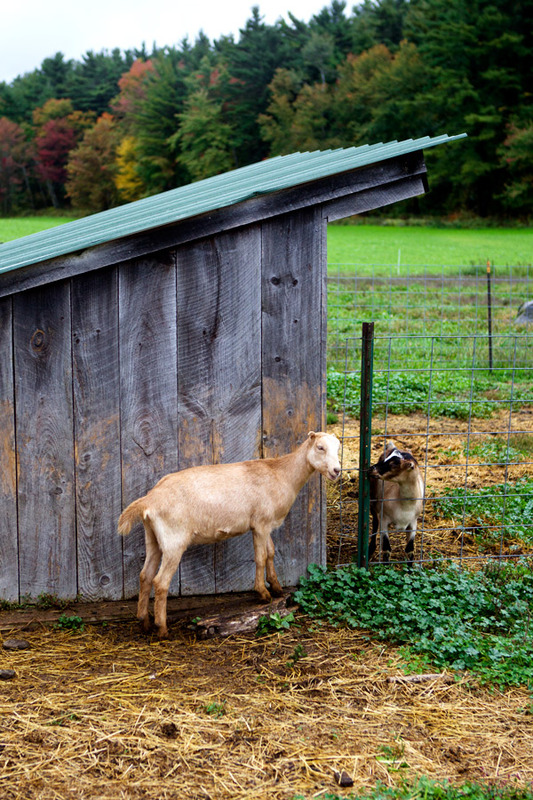 With her husband Eric, Ann runs the goat cheese business and farm. She tells me they’ve been doing it for fifteen years now. “I grew up on a farm in Pennsylvania“, she adds with a warm smile as she pets her old black dog who pushes himself against her legs. Ann looks like a real farmer at heart, someone loving what she does. 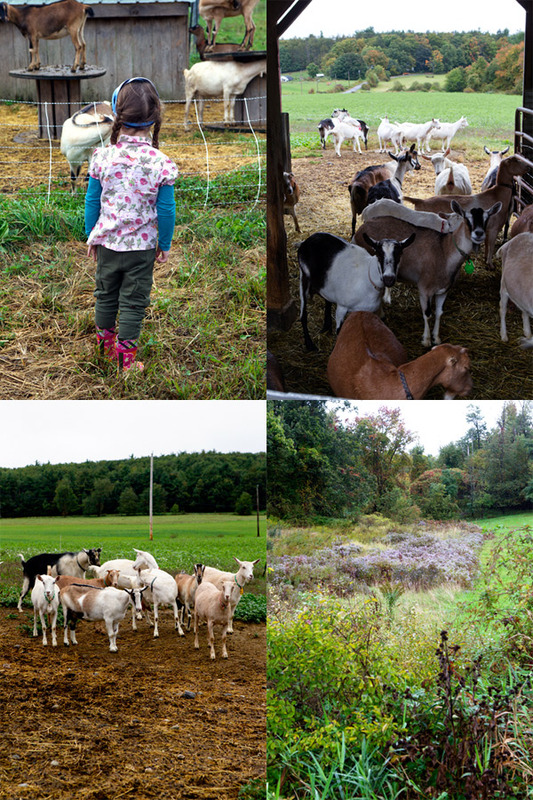 We spend a few hours looking at the goats and chatting with Ann who kindly explains how they make cheese. 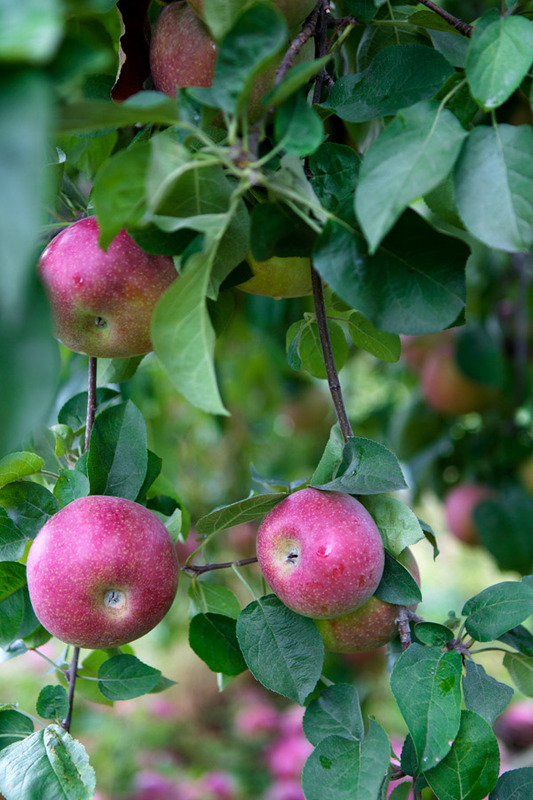 They produce different varieties, all of which are sold locally at farmer’s markets, in retail stores and restaurants, and at the farm stand on the property. I decide to buy a classic plain log because I’m interested in tasting the cheese in its most natural way . 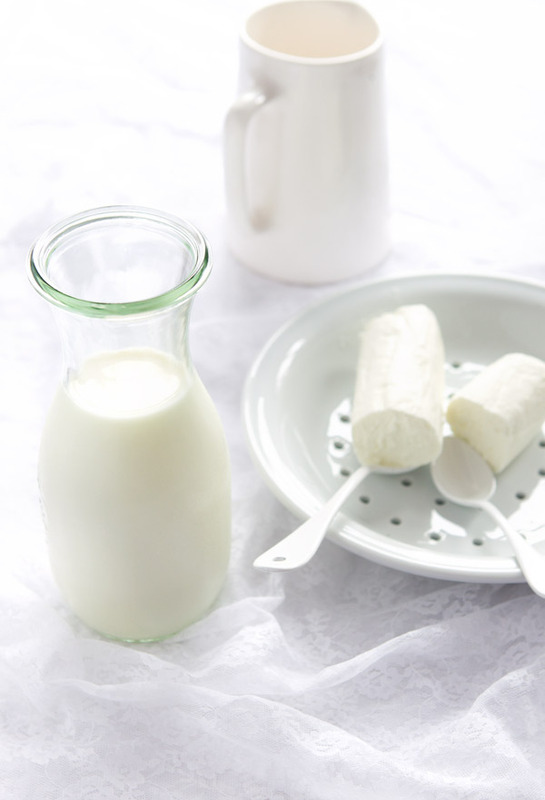 The texture is light and crumbly; the taste of goat milk is subtle–it’s simply superb. “Ready to go apple picking now?” I ask everyone as we are about to leave. “Oh oui ! Youpi !” we hear Lulu, Lila, and Maissa joyfully exclaim in chorus. We don’t say it but we feel just as they do. It’s clearly one of those lazy Sundays à la campagne when nothing is about what time it is. Lunch the next day is truly inspired by our Sunday outing. 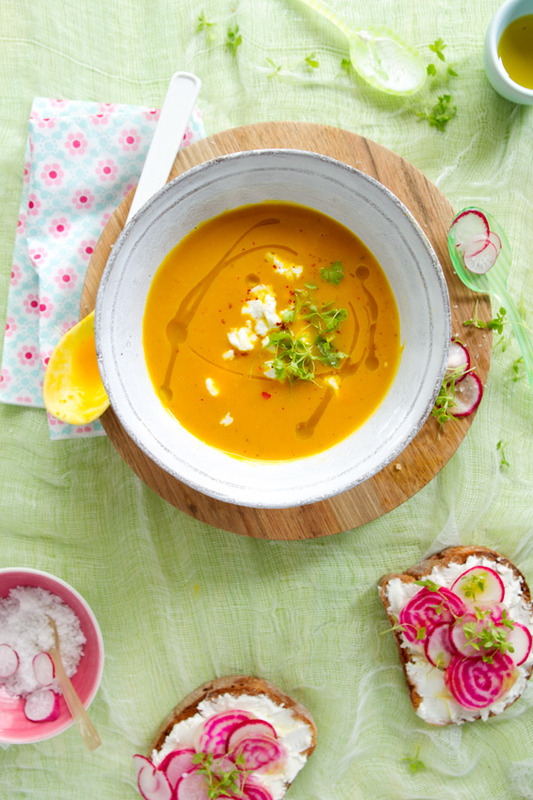 With the goat cheese and apples we’ve picked–along with vegetables bought at the market, I make a soup and tartines. 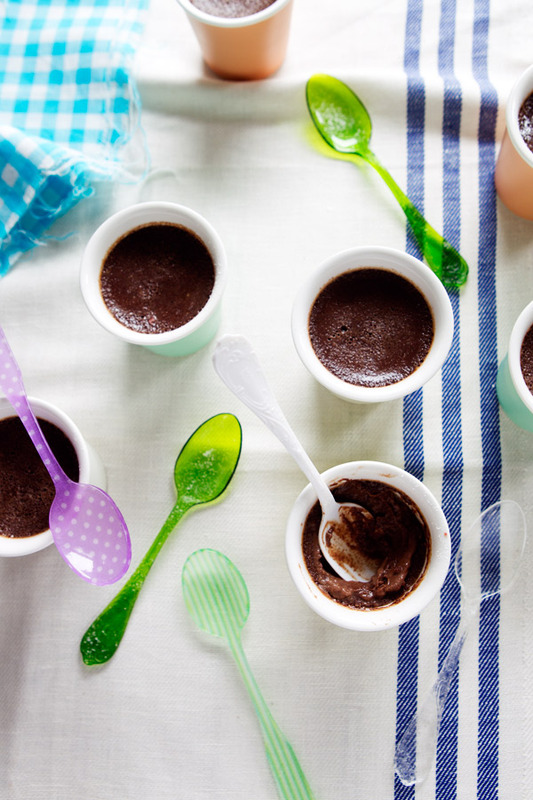 And after I pick up Lulu from school, she asks that we prepare our traditional weekly petits pots de crème au chocolat (Chocolate custards) together. My little one has her priorities right. In a large thick-bottomed pot, heat the olive oil over medium heat. When warm, add the leek, shallot, and ground coriander. Cook for 3 to 4 minutes. Add the squash and apple. Cook for 5 minutes, stirring occasionally. Add the water and fresh herbs. Season with salt and pepper and cook for 20 minutes, or until the vegetables are soft. Transfer the vegetables and broth to the bowl of a blender and purée finely (discard the thyme)–do this in a few steps because of the quantity. Check the seasoning again. Serve with crumbled goat cheese, red peppercorns, and sprouts. Spread the goat cheese on top of the bread. 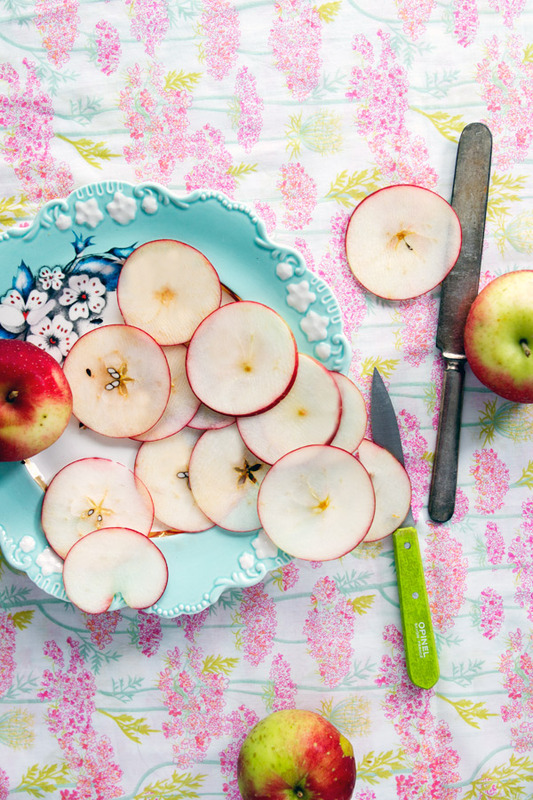 Arrange the beets, apple, and radish slices. To finish, top with sprouts. Drizzle with olive oil and add Fleur de sel. Get much pleasure from looking through your great photos! Thank you a lot for lovely mood. Those small ears!! So cute. Your photos are just effortlessly beautiful! 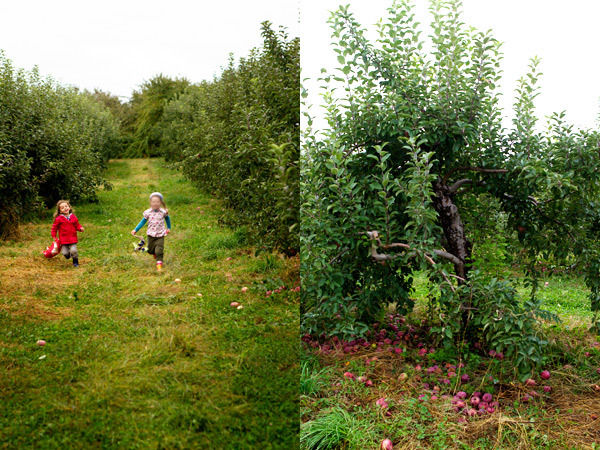 It seems you all had a lovely time at the goat farm and apple picking! 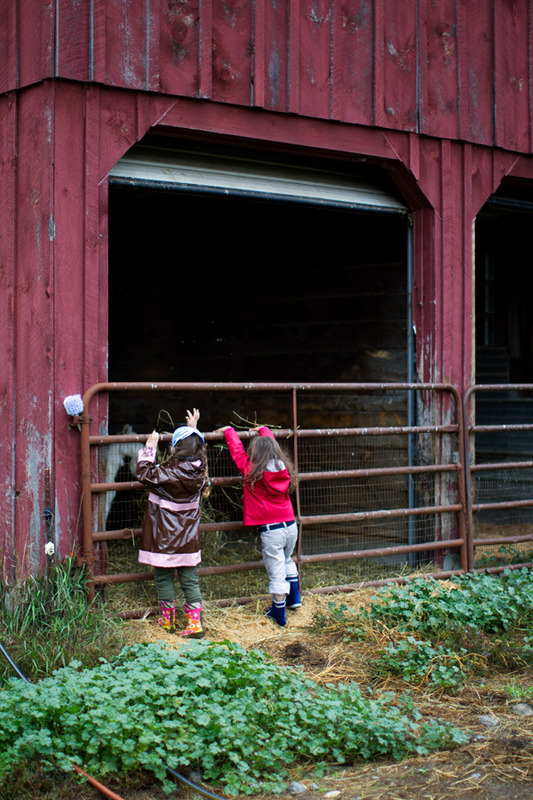 Those little arms lifting hay into the goat pen! Precious. is red kuri squash the english name for potimarron in french? 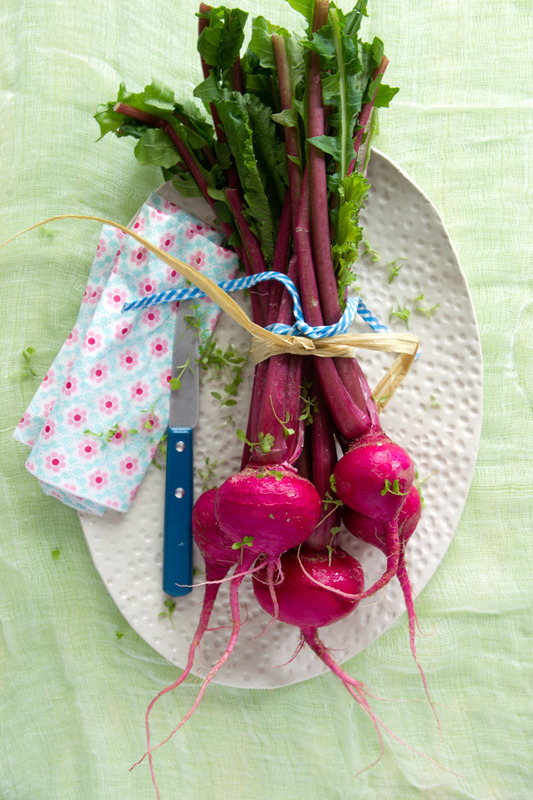 and what is Chioggia beet ? Dom, oui c’est bien du potimarron. 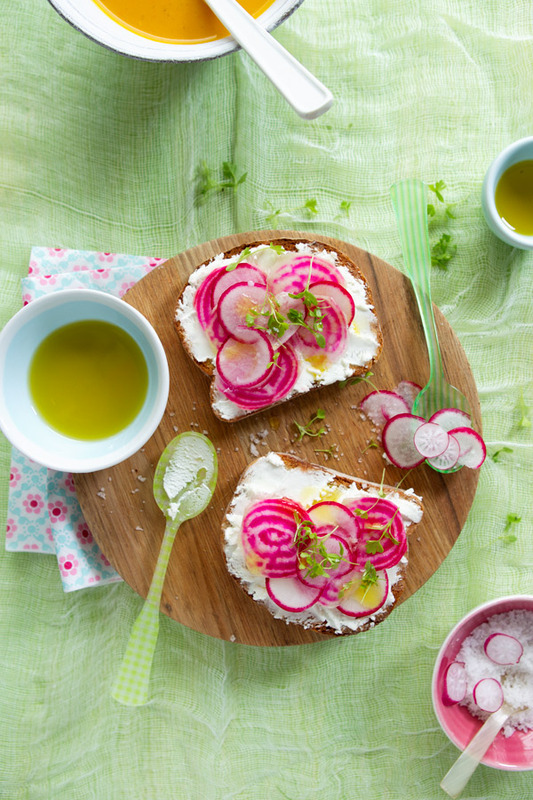 Chioggia beets: des betteraves rayées blanc et rouge fushia. Très jolies crues. Love that you went and visited. 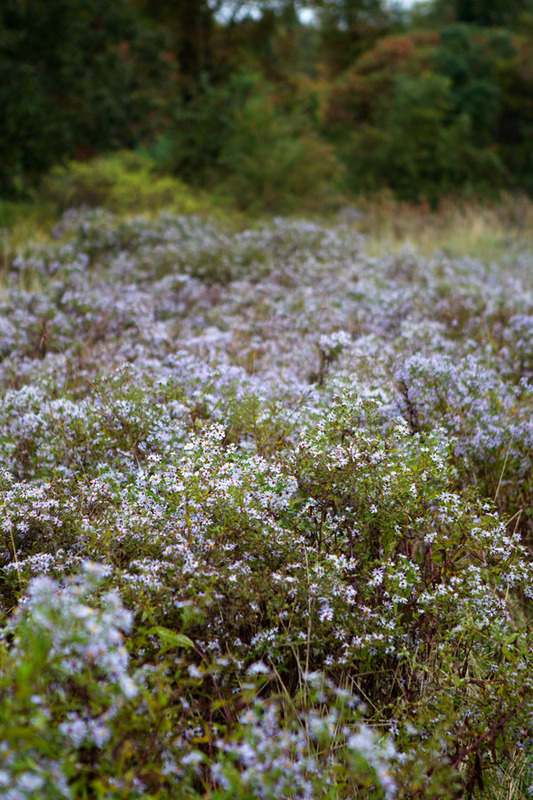 I have been a big fan of your blog for some time now and spent a great deal of time at that farm for my own photography. It is a truly special place. Love how you captured it as well. I LOVE your phtos, and I love your recipes. You are the best, is truth. Such great photos! 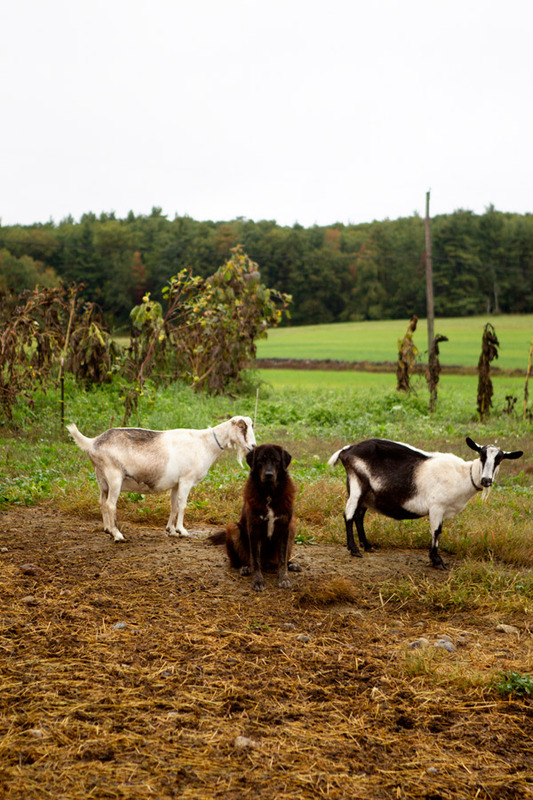 This post got me excited for the Sustainable Sunday Supper my friends are hosting this weekend at a farm that specializes in goat cheese in Topsfield. Bea, I bet you would love it. It’s a seasonal party open to the community, thrown by Chive Events, seems like it’s right up your alley! what a wonderful Sunday adventure! 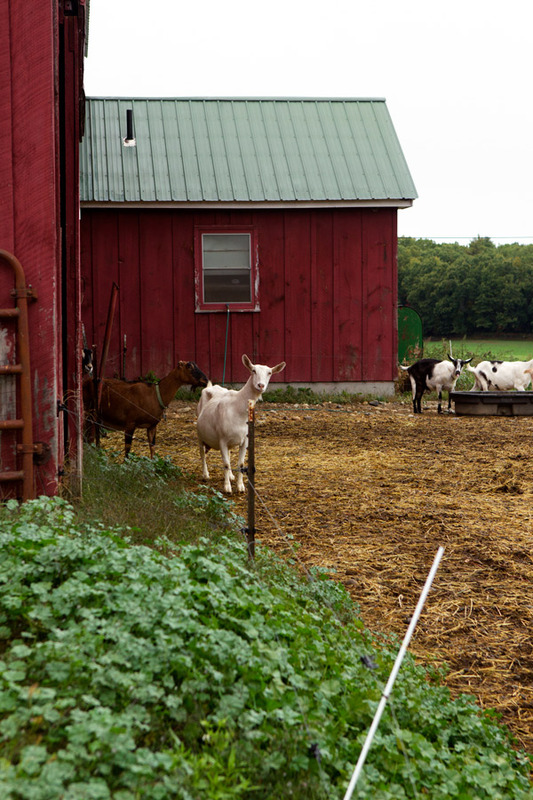 I’ve always secretly wanted a goat farm so I could have fresh goat cheese everyday. I love your blog. I enjoyed very much looking at your beautiful pictures.. the colors, the textures and the landscape!. Your daughters are adorable!. Thank you for the yummy recipes! What a lovely trip. The li’l ones had a blast. We were just talking about taking Daisy to a farm this fall. Can’t wait! 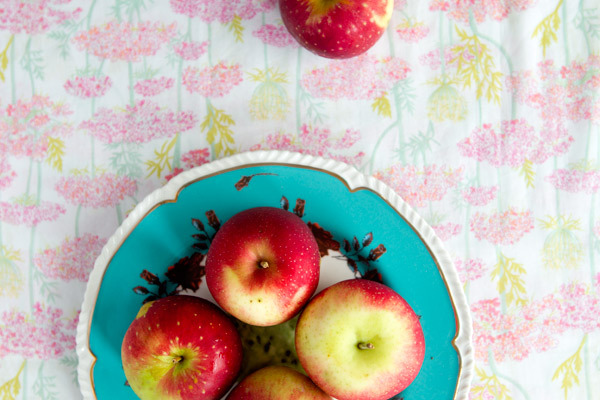 your blog constantly inspires me…both in terms of cooking, photography, and enjoying life’s pleasures. Gorgeous weekend adventure, Bea! And your daughter look adorable with that raincoat 🙂 Hope you’re having a great week. Gorgeous weekend adventure, Bea! And your daughter looks adorable with that raincoat 🙂 Hope you’re having a great week. 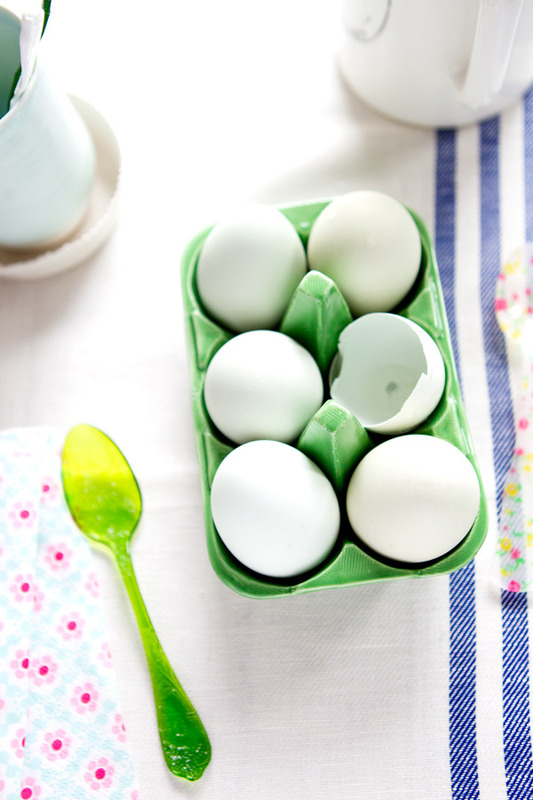 Love your blog, and your cookbook!!! 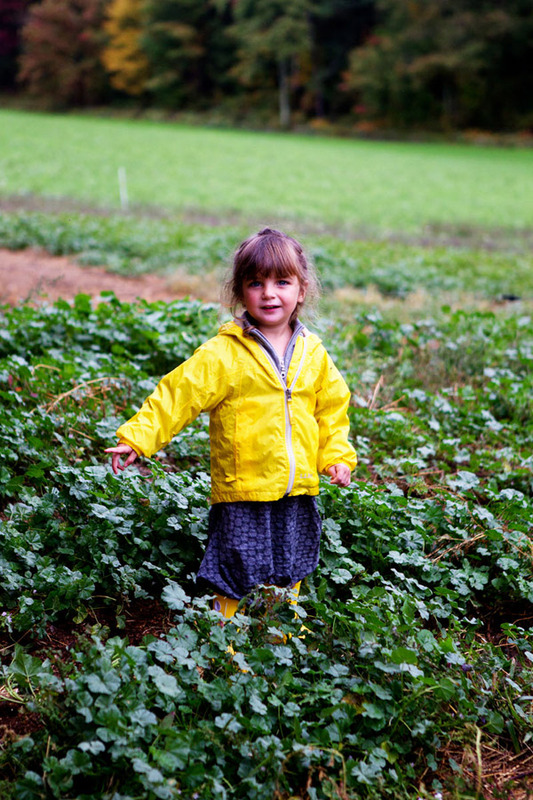 Where did you get the adorable rain pink floral rain boots on your daughter?? I have 2 girls and they would love them!!! Wow, Bea, what a breathtaking post… beautiful photos, eloquent words and recollections.. I just love your work… Bravo! 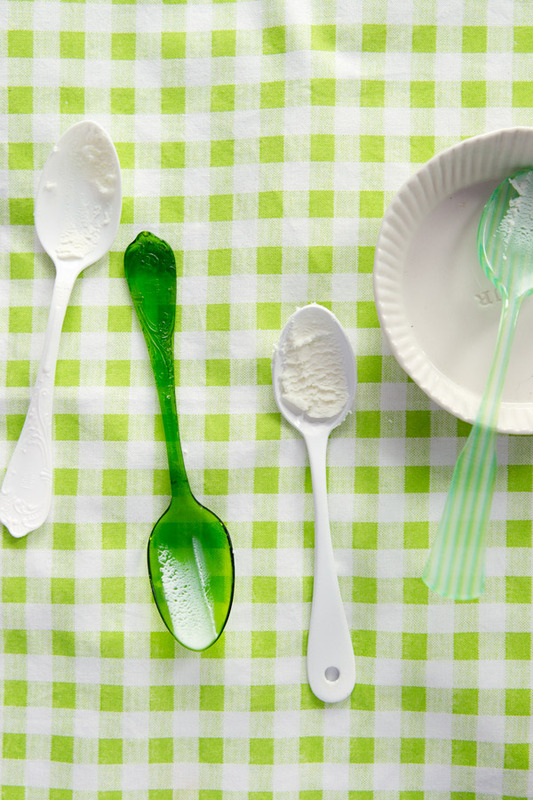 I do love your blog and have been following for some time. I just wanted to mention that these pictures seemed a little disconcerting. I have always respected your decision to protect Lulu’s privacy by obscuring her face in photos. But it’s odd to see that you would continue to do so even while showing the faces of girls her own age. Even if their parents permit, I am surprised you, who value it for your own daughter, would feel it’s a good idea. Thanks for your message and for sending your opinion. Protecting Lulu’s privacy is only my and my husband’s choice. Other parents may feel differently about it and I respect that. Hence the pictures you see here are here with the appropriate permissions–in fact, my friends who are the parents like to see them there–which shows that we are all entitled to feel differently about it. Che bella bambina. 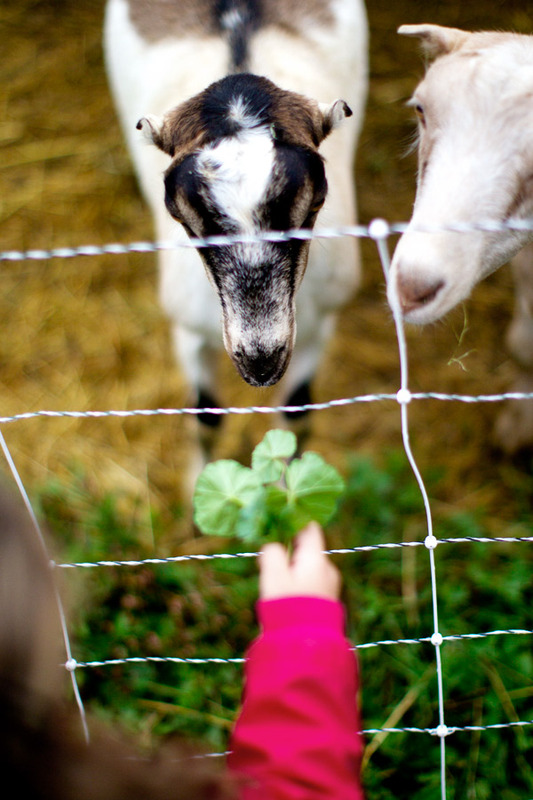 Le farm and goat pictures were wonderful. Thank you. 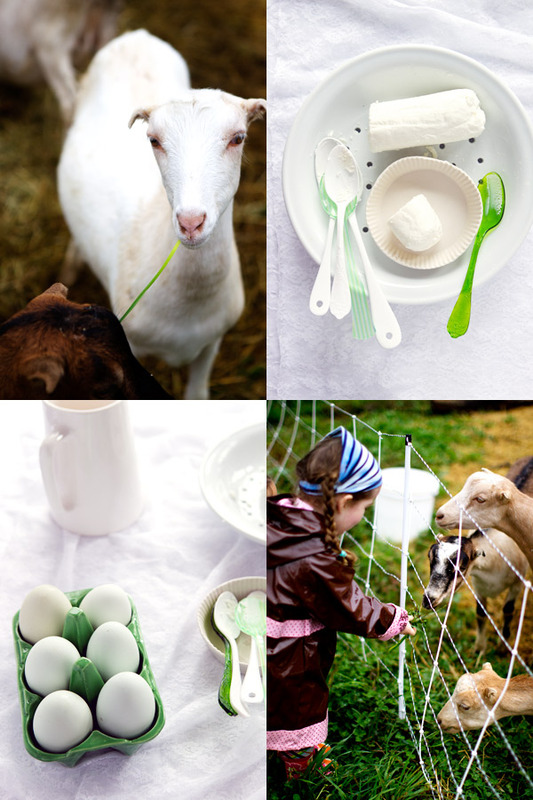 I’m insanely jealous that you get fresh goat milk and are able to make goat butter. 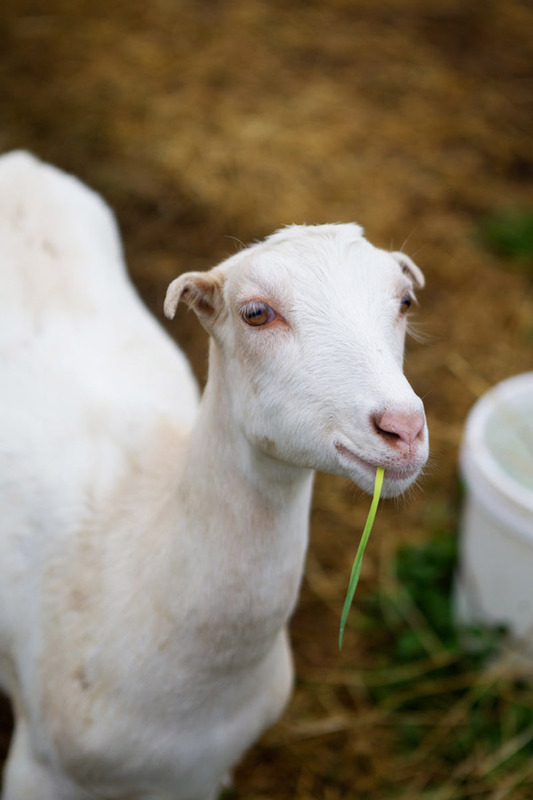 I want raw goat butter and raw goat milk! Oh my goat 😉 I love everything!